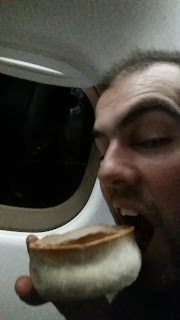 Following on from the apple and blueberry pie reviews of the last few days from my e-pie-c adventure to the land of the free and home of the sweet pie, the U-S-of-A, here’s the third and final part of my whistle-stop tour of the American pies I ate. 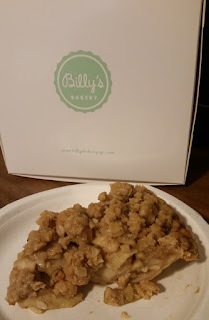 The final pie is the only proper apple pie I had – following the crumb topping of the Billy’s Bakery Pie – and was the best of the lot! The other side of the Williamsburg Bridge from downtown Manhattan, I first spotted Brookyln’s “Pies n Thighs” store on a stroll round the area on the first night we were in New York but we visited slightly later in my trip. Specialising in chicken and pies, it’s a pretty apt name really! They have a decent range of pies available, including a fully encased apple pie for $4.50 a slice (£3.65 in English money). 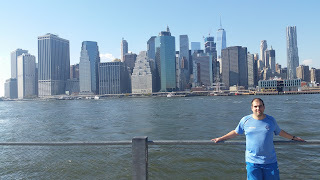 With a quaint little store in a funky part of town, it is a bit out of the way compared to downtown Manhattan but well worth the trip over to Williamsburg, Brooklyn. The golden pastry was lovely and buttery, crisp and held together really well. The apple too was the right blend of crunch and mushy sweet filling. Certainly the best pastry I had over in America and better than many sweet pastries I’ve had on these shores, the cost of the pie at $4.50 is also a bit more reasonable for a slice of pie, with the option of adding ice cream for a few dollars more. The store was quirky and atmosphere was good, with a good selection of pies and I’d certainly recommend visiting it. Pierate Highly Recommended! Lower Manhattan - Surely there's some pie in there somewhere?! Summer and Fall of 2016 was American Pie Season at Pierate! Just like London buses you wait a long time for a Pierateer to head stateside and then we go over twice within a couple of months! 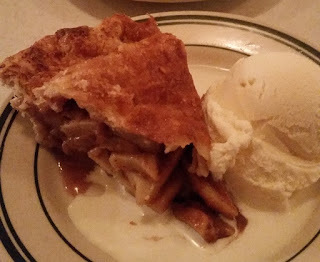 In August work took Pierateer Sam over the Pond and you can take a look at our Chicago Pie Tour to see where Sam went. continue reading "New York Pie Review: Apple Pie from Pies n Thighs"
After diving off the subway and speedily walking along the busy major road that is Delancey Street, I was glad to pull out of the rain and into their quaint little pie shop and see the staff hard at work making delicious looking pies! 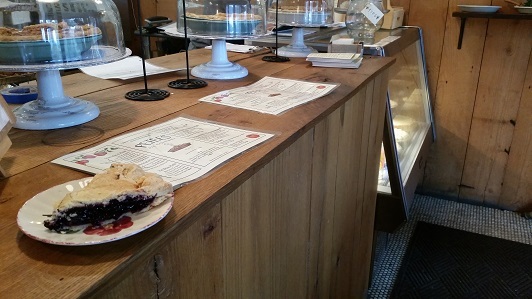 It’s not the biggest shop – with a few high stools to sit at if required but most customers picking up a pie/slice and leaving – but I appreciated most of the space was needed for pie production. As said in my article yesterday, the Americans have their own interpretation of pie, which often lacks pastry and full encasement. 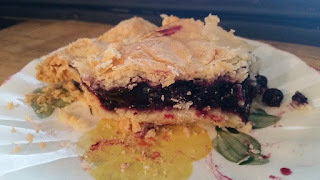 However there were a few options meeting my criteria in Petee’s Pie Shop and I decided to go for something different and choose a wild blueberry pie. The pie was $5.50 (that’s £4.50 in English money) and again you got a decent slice for your dollar. It seemed pretty much the going rate for a slice of pie from a pie shop round these parts – though I did manage to get a slice for $4.50 at a shop in Brooklyn (more about that later in the week!) Again the price wasn’t terrible for a slice of pie considering the central New York location and it equating to a posh slice of cake in a London deli, but compared to a lot of pies it’s still quite pricey and unlike yesterday’s review they didn’t really have a proper seating area to charge for either. Instead Petee’s Pie Company focused on the pie. In fact, it was pretty much pie, pie or pie here! 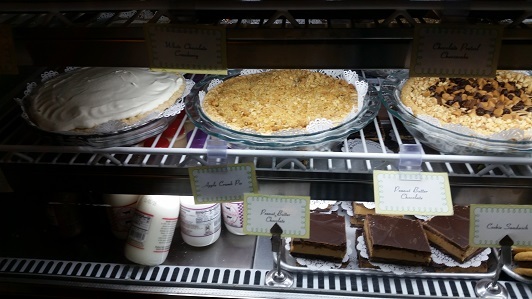 Both regular and gluten free, they bake pies for your pleasure! Sure, if you study the menu you will find a few cheesecakes and other goods, along with a selection of beverages, but this is first and foremost a pie shop, not a general bakery. So for this, I commend Petee’s Pie Shop to you and their crazy late opening hours (Midnight or 1am every night of the week)! In fact you don’t get a recommendation like “The absolute best pie in New York” (via NYMag – New York Magazine) without clearly selling great pies. But perhaps that was on the American definition and appetite for pie that got those remarks, as while the wild blueberry pie was very nice, it didn’t blow me away like the NYMag recommendation had hinted at. Sure, the fruit was fresh and I thought the pastry held together quite well, but the pastry was a bit dry in places and quite crumbly. While this by no means made it a poor pie – on the contrary it still rates quite highly! - based on pastry alone, this one was third place out of the three pies I had in New York. Still, it's one of the top scoring blueberry pies I've had and I’d like to go back some day and try a few more of their pies, as it was still very nice and I’d enjoy trying their range, but with such a high calibre available it just misses out on a Pierate Recommended score. continue reading "New York Pie Review: Wild Blueberry Pie from Petee’s Pie Company"
Still, I wasn’t going to turn down a good looking pastry pie – and one is better than none!!! The Apple Crumb Pie was $5.50 (that’s £4.50 in English money) and a decent slice for that. It seemed pretty much the going rate for a slice of pie from a pie shop round these parts – though I did manage to get a slice for $4.50 at a shop in Brooklyn (more about that later in the week!) Not too bad for a slice of pie, considering the central New York location and it equating to a posh slice of cake in a London deli, but compared to a lot of pies it’s still quite pricey! Still, it’s hard to argue when you hear an opening line on their website like this: “It all began in 2003 with two friends from business school who shared a sweet tooth and a dream of baking.” Tucking into their pie, I can see why they got involved in a business that sells and makes quality pies! The fresh ingredients and rich buttery taste make for a wonderful pie. The Apple Crumb Pie was amongst a range of more typical American dessert pies. The chunky, crisp apple pies are held together by a tasty, buttery bottom crust and then a crumbly, oaty topping is layered on top. It reminds me of a number of “crumble pies” I’ve had before in the UK, which combine a pastry base with a crumble like lid. Sure, if I’m being strict it’s not quite a proper pie by our high standards, as it is more a layer than a lid, but it was at least fully encased. It was also darn tasty! While the topping did slightly crumble off in transit back to our hotel (as it was almost closing time in the shop by the time we’d got there) it was captured in the lovely pie box I was given to transport it in. And the crisp pastry base held together perfectly and gave a delicious crunch to the pie. All in all, the condition was decent apart from the crumbling, while the colour was quite golden and the capacity was strong, with plenty of apple chunks. A bit chewy at times but a good slice of pie! Co-founders Marc and Wayne have done a great job in providing that 1940s “grandma’s kitchen” feel to the store and it appears New Yorkers have fallen in love with their wares too, with three stores across Manhattan. With a Pierate Recommended pie, I can see why. Great work Team Billy! continue reading "New York Pie Review: Apple Pie from Billy’s Bakery"
Welsh pie maker Peter's are a bit like an old friend of Pierate. Common at fish and chip shops and also served at our home town football club we have eaten quite a few in our time. 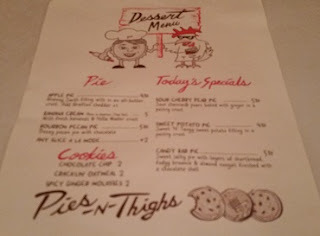 We also reviewed quite a few of their pies although it is notable we haven't reviewed any for a while. 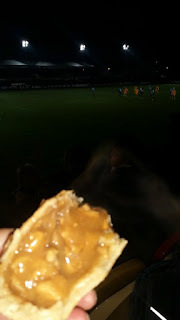 It is also notable that I haven't see many at football grounds recently, which is apparent by the lack of Peter's pies in our PIEremiership Football Pie League. A trip to Peter's heartland in Wales help rectify this as Pierateers Rob and Sam headed over to the Newport County vs. Wycombe Wanderers match. Upon entering the away end of Rodney Parade we were a bit worried to see that the catering options were dominated by burger and chips. However, when we asked they went and fetched some hot pies from another outlet. Phew! Rob went for a Chicken Pie and Sam opted for the Steak at the steep price of £3.50 which had me frustrated again at the #PieHighPrices. This price was surprising given that Newport have told the BBC Price of football survey that their pies cost £2.60. We wondered if away fans were being fleeced with a higher price than home fans (as we found at Cambridge). Whilst it was nice to reunited with Peter's pies again, after having reviewed nearly 600 pies we have tried a lot of very good pies. It is perhaps the case now that we have higher expectations than when we started on this pastry journey. Hence I did find my pie a bit disappointing. To be fair, this may not have been the fault of Peter's. It wasn't cooked very well. 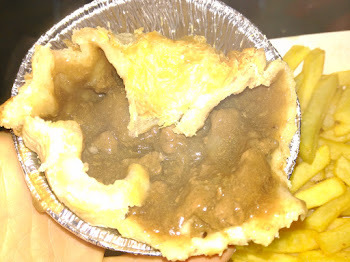 Often the case with football pies cooked in a rush, it had soft and stodgy pastry which didn't hold together well at all, I am not sure why so many football ground sell pies like this. My Steak pie fell apart completely although Pierateer Rob seemed to get on a little better with his. The filling for my steak pie wasn't bad. It had quite a lot of meaty chunks in a fairly standard, but tasty, onion flavoured gravy. The meat wasn't too chewy but it wasn't as soft as I remembered from Peter's pies. It also wasn't as flavoursome. Overall, if it wasn't for having no other pie option in the ground, I wouldn't be choosing to get this pie again. 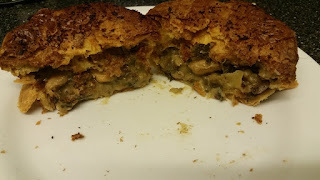 The chicken pie eaten by Pierateer Rob had similar flaws to it. Again the pastry was far from ideal, collapsing under the soft and stodgy pastry. The chicken filling was quite nice, with the creamy sauce blending well with the chicken chunks. However it took a number of bites to even reach the chicken filling, with a rather large air gap and not overly strong capacity. And while the pie lid was quite crisp and tasty, the rest of the pastry was nothing to write home about and disintegrated far too easily. For a football pie, the filling flavour was reasonable (which doesn't say much for some of the lower rated pies in our PIEremiership table!) but he wouldn't choose to eat it again. Make sure you Follow @pierateersand let us know your thoughts! 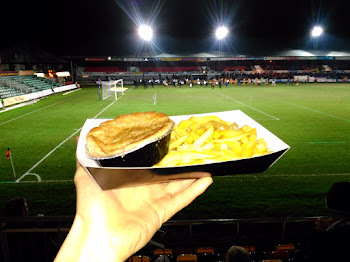 continue reading "Football Pie: Petering Out at Newport County"
A lot has happened on Pierate since that 200th pie review almost three and a half years ago – namely almost another 400 pie reviews plus multiple TV and radio ap-pie-rances! But they have also in the Higgidy kitchen too, with a wider range and much more regular availability showing the growth the company have made too. I mentioned in my 200th review that it was more like me having to sail the seven stores than the seven seas to find a Higgidy pie back in 2013, before getting my hands on one of their pies! 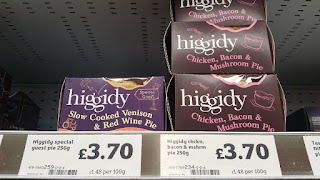 But for International Pierate Day 2016 I was able to pick up two new Higgidy pies at my local Sainsbury’s for £3.70 each, which is just 21p more than what I paid back in 2013 (though the pies are still the same size at 250g). On the shelf, one of the things that really stands out is the attractive packaging, with a number of intriguing features including the care put into selecting only the best ingredients (in the case of the chicken pie, even stating which farm it is sourced from!) and a cheeky see through plastic glimpse of the pie in question. It is clear from the packaging and the quality of the pie when eating that these people clearly love their pies! The box states the pie was “lovingly made in Shoreham-by-Sea, West Sussex” and I very much appreciate the care and attention put into it. The pie holds together well, has good content and interesting flavours. With 4 pies already scoring over 5/7 (thus being “Pierate Recommended”) Higgidy know how to make a good pie! So how did these two flavours rate? 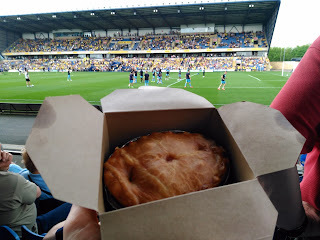 This “special guest” pie – available for a limited time only – was a nice addition to the Higgidy family, from which we had not had a venison pie before. Regarding the content, the meat was nice and tender from it being slow cooked and, while a bit lacking at just 22%, it did give a nice flavour to the pie. The first few bites were slightly dominated by the chestnut mushrooms and the cranberry and apricot stuffing does add a surprising sweetness to the underside of the crisp puff pastry lid, however these flavours do combine to give the pie quite a unique and seasonal flavour. However the biggest surprise was hint of dark chocolate, which certainly added some additional richness to sauce. 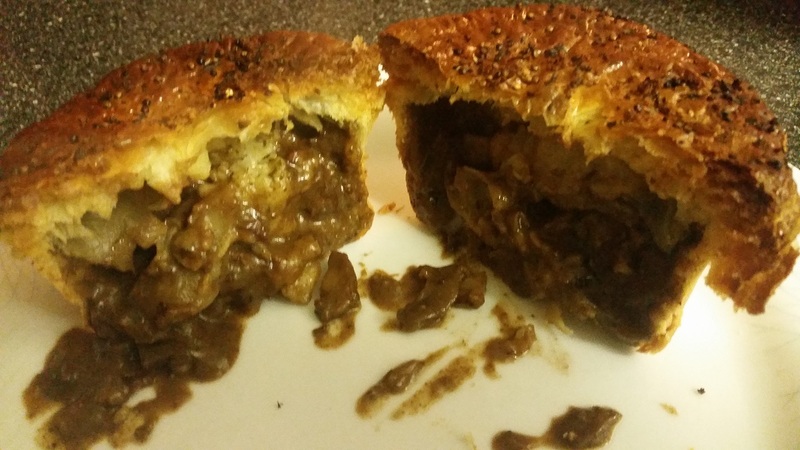 While not really my cup to tea, I can understand it adds an extra texture to the pie sauce and would appeal to those who like something quirky in their pie fillings. It does however dominate the flavour a lot, so not ideal if it doesn’t take your fancy. The capacity was a bit lacking too, so while a good content the air gap does bring the score down a bit. The Higgidy pastry, as ever, is very good quality. The pastry is a golden colour and perfectly held together. Fully encased with short crust pastry sides and base and a buttery puff pastry lid, it is a classic example of pie pastry done well, holding together and giving you a good crunch on top while holding the moist filling. The puff pastry lid, in particular, was very nice. I commend them for something new and it is certainly not lacking in flavour, once again being awarded Pierate Recommended status. Similarly the pastry was very good for the chicken, bacon and mushroom pie and a highlight of this pie. Golden and crisp, it complimented the filling well. Again the meat content could have been a bit higher, at just 19% chicken and 7% bacon, but it was once again the mushrooms that slightly dominated the flavour, with three different types of mushroom in this pie (making up 16% of the pie!) The creamy sauce was pleasant and complimented the pie well, again leading to a Pierate Recommended status pie. 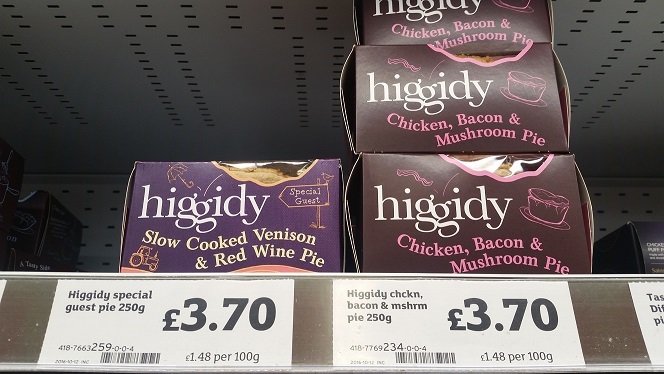 In summary, Higgidy have once again produced two recommended pies. While both could have been a bit bigger and had more meat content for the price (£3.70 for a 250g pie), they were certainly both being sold as and delivered as a pie on the top end of the supermarket range. A bit more meat would have boosted them ever so slightly higher in the rankings, as neither were at full capacity when you cut into the pies, but in general two pies worth getting your hands on! continue reading "Higgidy pies to celebrate International Pierate Day"
Well we can't deny it's been a while, but Friday Pieday is back for a pre-Christmas special! Though perhaps sur-pie-singly it is lacking on the festive Turkey and Mince Pie reviews you may expect at this time of year and instead focusing on pies in the media, as it seems you just can't keep a good pie down... quite literally in the case of our top story! Our "Pie in the Sky"
Pie in the sky?! Just watch this space!!! You may well remember back in British Pie Week 2016, which we extensively covered here on the home of the pie review, that Pierateer Rob pie-oneered "Pie in the Sky" by enjoying a World Scotch Pie Championship winning Scotch Pie from The Kandy Bar Bakery on his flight back from Glasgow to Birmingham. However it appears some pie fans in Wigan have taken things one step further! As reported on the BBC News website, to celebrate the upcoming World Pie Eating Championships in Wigan some pie fans have only gone and sent a meat and potato pie up into space!!! Attaching the pie to a balloon, it's believed to be the first pie sent into space and there are scientists studying how the pie will react to being so far above the Earth's crust! Will it freeze in the outer atmosphere? Will it burn up upon re-entry? The pie scientists are hoping to find out soon! You can see a snazzy little video on the BBC website right now! While the full details cannot yet be unveiled as it is still at the idea pitching stage, this week Pierateer Rob was once again advising the BBC on a potential pie-related clip for hit BBC show "Rip Off Britain". 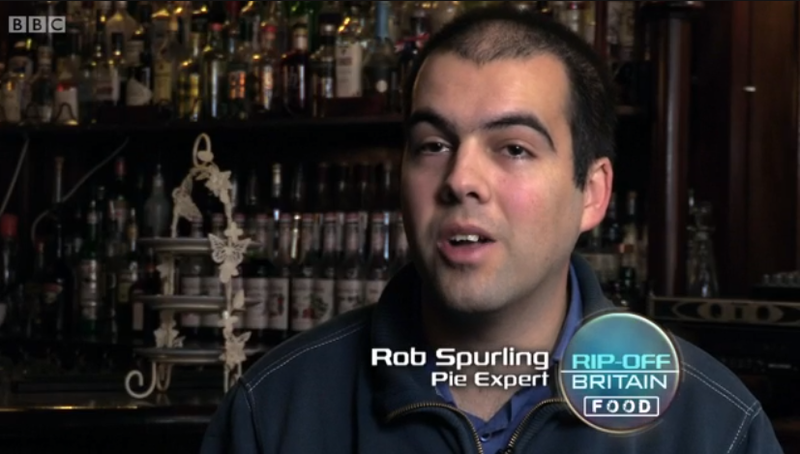 You may remember that back in February 2015 Pierateer Rob was filmed by the BBC talking football pies, for an episode of "Rip Off Britain" that aired in April 2015 and has been repeated several times since. This follows our appearance on BBC hit show The Great British Bake Off: An Extra Slice and several BBC Radio ap-pie-rences! While sadly that episode of Rip Off Britain is no longer available on BBC pie-player, you can still see us on the BBC Sport website talking football pies! The Sun's Sports Section covers our PIEremiership! Turns out it's not just the BBC wanting to get their hands on top pie-fessional advice when it comes to pies! Just a few weeks ago Pierateer Rob was also featured in The Sun newspaper's sports section talking about the best football pies. Featuring just shortly after the BBC announced its annual Price of Football survey, which we covered in our article on the Pies of Football, The Sun contacted us to find out more about football pies and grab a slice of our PIEremiership - where we rate the pies at football grounds up and down the land! You can find out more about Pierate's Football Pie League and a whole host of other football pie related info right here! This includes the Pierate Highly Recommended pies from Morecambe FC, which rate as our number 1 pies in football. continue reading "Pieday Friday - 16th December 2016 - Pie in space and Pierate in the media"